Hello! Happy Sunday! Can you believe it's already the last day of September? As usual, this year seems like it is just flying by. I have a Halloween card to share with you today. 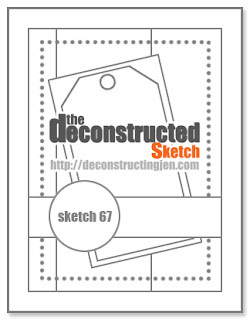 I used Jen's Deconstructed Sketch #67 from a few weeks ago for my layout. For my Halloween card today, I inked up Graphic Greetings Halloween. I first stamped it using Versamark Watermark ink, then I added some fine black embossing powder and used my heat gun to complete the embossing process. My paper and ribbons are from the Tricks & Treats Project Pantry Kit. I added some hand stitching around with black crochet cotton. 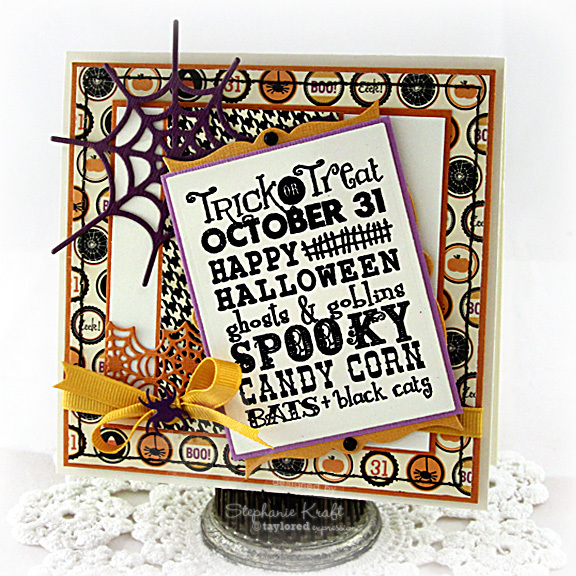 What a Spooktacular card Stephanie! Love the spider webs and sentiment! Your black stitching adds a great touch!